Established in 1946, The Green Gables Motel is well-known for its unique style and ambiance. Each room has a gable covered porch looking onto the central court. The property is surrounded with mature pine trees. The Green Gables Motel is within easy driving distance of some of California's most awe-inspiring attractions. Burney Falls, which President Theodore Roosevelt christened "The eighth wonder of the world." is only 10 minutes away. Majestic Mt. Lassen, Lassen National Forest and Lassen Volcanic National Park are within easy driving distance. Complete your stay with a round of golf at the nearby 18-hole championship Fall River Golf Course. This course is frequently rated one of the top golf courses in Northern California, with gently rolling hills, beautiful lakes, mature trees, abundant wildlife and a friendly atmosphere. 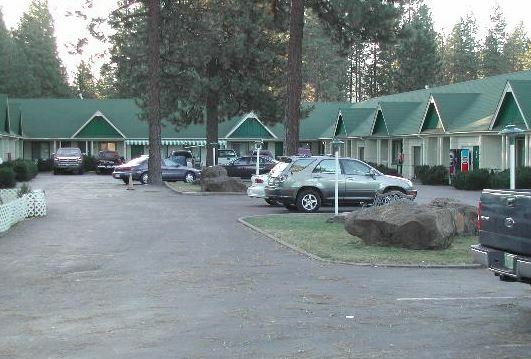 Located in the picturesque town of Burney, in the heart of the California Cascades the Green Gables Motel is in the center of some of the state's finest trout fishing. Hat Creek, a trophy catch-and-release stream is just a short drive from the comfort of your room. A quaint mountain retreat with your comfort in mind! "Very clean. Very quiet. Comfortable bed. Huge bathroom. Very cute porch. Nice breakfast. Modern amenities in a quaint setting. Fridge, microwave, coffee maker all in the room. Pine furniture was very pretty."